Last chance: We only have 11 left - This product will not be available again once our stock runs out. 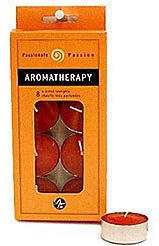 Enjoy a romantic interlude with these scented Aromatherapy Passionate Tea Lights! Buy 1 for $0.99Buy 2 / Save $0.05!Buy 3 / Save $0.20! Size (inches): 1.97" X 0.79" X 4.72"
This set includes 8 long-lasting candles that are ideal for aromatherapy oil burners or for small candle holders. Richly colored in a deep red and lightly scented, these lights can also be used on their own placed atop the side of a bathtub, or as a floating display with flower petals in a vase. With a little help from the Passionate Tea Light set, let your imagination and creativity light the flame of renewed romance!